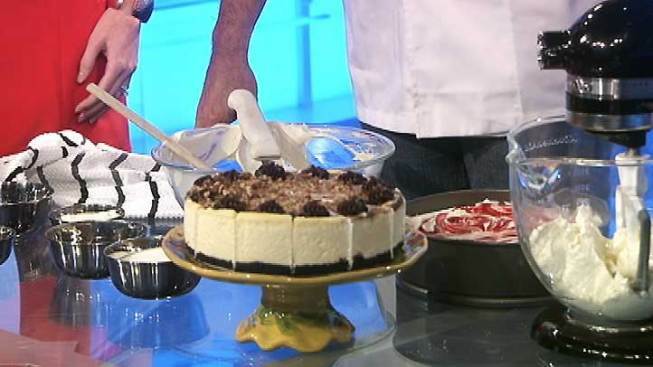 The Cheesecake Truck Chef Craig Barsi's classic vanilla cheesecake recipe. Mix first three ingredients in bowl well, and press into a 9 inch spring form pan. Bake at 350 degrees for 10 minutes, let cool. In mixer, beat cream cheese until smooth. Add sugar and beat until fluffy, scraping bowl once. Add eggs one at a time and scrape bowl once more, beat until well mixed and fluffy. Finally, add the sour cream and vanilla and beat well. Pour into prepared pan and bake at 350 degrees for 40 minutes, remove from oven let cool. For best results, place cake in freezer overnight, then remove outer ring when frozen. bring to refrigerated temperature to serve. Serves 12-16.